Each year on December 23, I celebrate my favorite holiday of the year: Leap of Faithiversary. On that date in 2013, Eddie Traffic took a flying leap of faith off of a transport truck en route to slaughter traveling 70+ mph on a busy highway, and he subsequently became an international hero. That remarkable story can be read in full here - OPERATION 303. It’s hard to believe that four years have passed since since Eddie jumped off of that truck, not only because so much in the world has changed, but also because of the impact he continues to make on humans and animals alike through his bravery. I do believe that leap was taken with desperation gnawing at Eddie’s every thought, but I also believe that beyond desperation was an overwhelming sense of optimism, faith, and trust that where there was light, there was hope. I often think about how many other pigs saw the very same opening that day and didn’t leap… and what enabled Eddie to be so courageous to be the one who did. Whatever it was that happened in that moment of faith, Eddie became the bravest, strongest, most spiritually driven superhero imaginable - and when that story went public, he became a social media superstar, and also my own personal warrior. I read Eddie’s story and saw his first photos before I was a regular visitor at Indraloka Animal Sanctuary, but I had been there once before and when I found out Eddie would be living there, I knew I needed to return to meet him in person. That winter I wrote to Eddie. I emailed him my most personal fears and my grandest hopes. When he wouldn’t allow humans to remove his painful ear tag, Number 303, I shared with Eddie that I too hold on to things that hurt me sometimes, and that I hoped as we got to know each other better, that we would each let go of those painful memories and allow our healing to begin. It never occurred to me that there was a human responding on his behalf on the other end of those messages- to me- the words were communicated directly between me and Eddie. I didn’t fully understand what was happening, but I knew that pig was changing my life in a dramatic way. 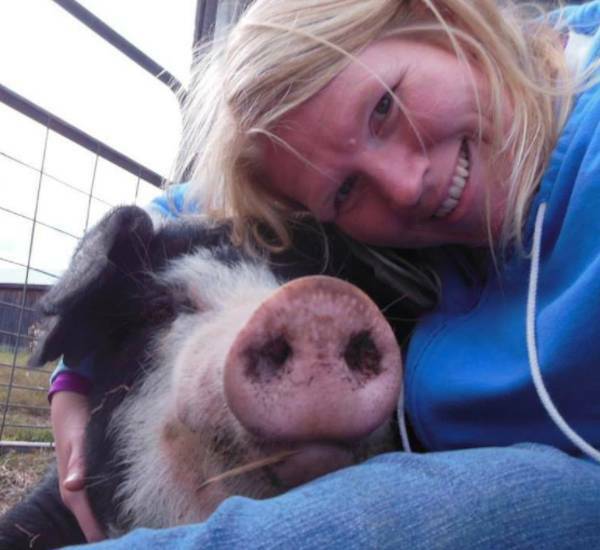 After we met in person and spent several months getting to know one another, Eddie welcomed me into his pasture for belly rubs and long chats about anything and everything… Eddie was quickly turning into one of my best friends. As that friendship developed I often thought about what bonded us. It wasn’t as simple as enjoying each other- although that was true. I truly believe that he was brought into my life to teach me the exact things we wrote about to one another from the beginning: taking leaps of faith to change the course of our lives, and to let go of the things that hurt us most. While I also express endless gratitude to some of the best mentors I could ever ask for in my life, Eddie provided a different outlet- one that allowed me to be my truest self without fear of judgment, abandonment, or ego. During that first year of friendship, changes happened in big ways… and I was thrilled. As the years have continued though, I truly feel like a new person. I feel like I see the light that drives me to leap every single day, and even in moments of instability, I trust that wherever I land will be a place with meaning and opportunity. Eddie has inspired that kind of life transition, and I cannot be more grateful for his beautiful shining example. With all of that said, each year on December 23, I have made it my focus and intention to thank those who have helped me to take leaps of faith in the preceding year. They may not have been huge leaps, but in my opinion, every single one counts- because each small leap changes the direction and flow of everyday life! It’s a way of spreading the incredible optimism and fearlessness that Eddie Traffic exemplifies- and making sure his story is shared with a bigger and bigger audience each year. On December 23, 2017, I witnessed 500+ children shouting “Happy Leap of Faithiversary, Eddie!” during a school assembly. They may not understand exactly what that means right now, but the seed has been planted… they have heard the words, they have seen his photos, they have read snippets of his story. To my mentors, friends, and family, I thank each and every one of you for helping me and encouraging me to continue to take leaps of faith… thank you for believing me when I shared that a pig- a whole family of pigs- was changing my own life, and the lives of many others. Thank you Eddie for jumping that day when the fear must have been overwhelming. Thank you to the truck driver who kept him safe, to the reporters and writers who first shared his beautiful story, to the sanctuary for inviting me to meet Eddie snout to nose, and to Indra for encouraging me to volunteer and spend more time with the animals in person. Thank you to so many people who read about Eddie and ask questions every day! Most of all though, consider sharing with your own friends, family, and mentors a sense of gratitude each year on December 23, and consider sharing Eddie’s story with them. Imagine how great the world would be if we would all take more leaps of faith- and if we would express gratitude to those who are there to cheer us on, or help pick us up when those leaps don’t land the way we hope or plan. Most of all, consider the lesson Eddie teaches with the most clarity- to have faith in the light in front of you, and to seize the opportunity when it presents, regardless of the odds of landing softly.